Charon has a huge expanse of cracks and craters four times as long as the Grand Canyon. This is according to the best resolution color images yet of Pluto's largest moon, captured by New Horizons during its flyby of Pluto back in July. The enormous fractures stretch over the exterior of Charon, which is nearly more than half of Pluto’s size, revealing an amazingly complex and intense history. 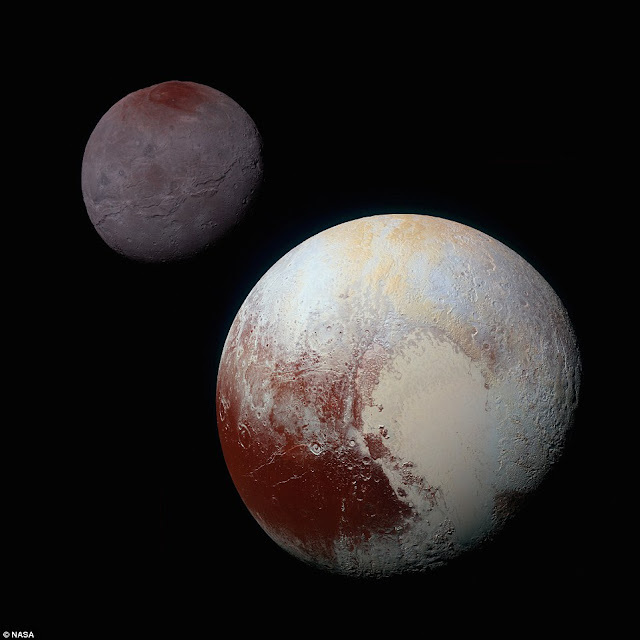 At half the diameter of Pluto, Charon is the largest satellite relative to its planet in the solar system. New Horizons researchers anticipated Charon to be an uninteresting or boring, crater-battered world; but reality is different from what they thought, they're finding a Charon’s surface concealed with mountains, valleys, landslides, surface-color deviations and much more. Ross Beyer, a member of the New Horizons Geology, Geophysics and Imaging (GGI) group from the SETI Institute, said “We thought the probability of seeing such interesting features on this satellite of a world at the far edge of our solar system was low. But I couldn't be more delighted with what we see” High-resolution pictures of the Pluto-facing surface of Charon, captured by New Horizons as the spacecraft flown through the Pluto system back in July 14, disclose details of a strap of fractures and canyons just north of the moon's equator. This huge canyon system expanses more than 1,000 miles (1,600km) across the complete surface of Charon and most likely around onto Charon's far side. 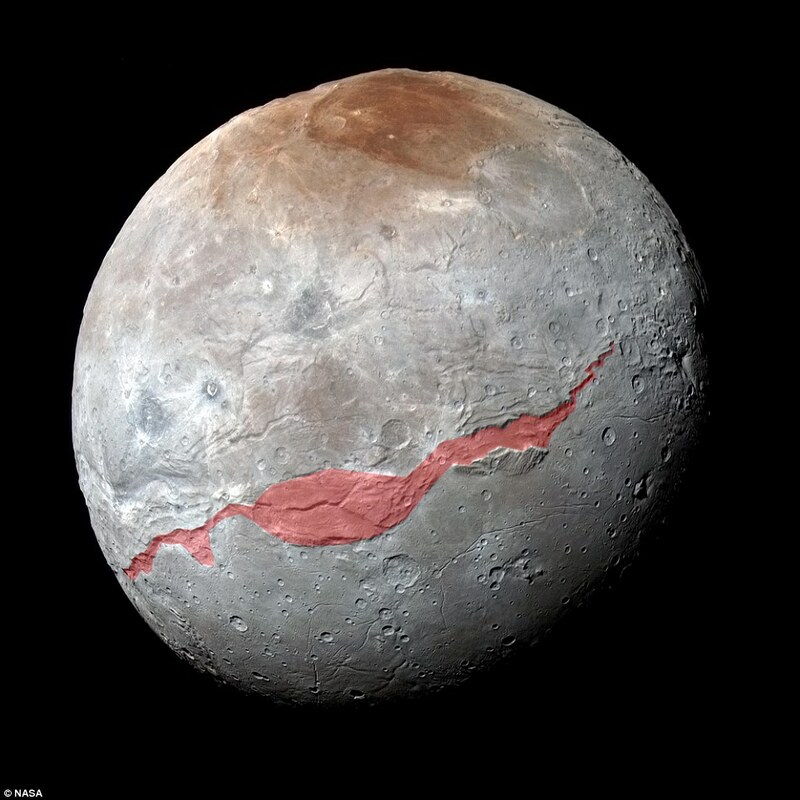 The canyon on Charon, painted in red, expanses more than 1,000 miles (1,600km) across the whole face of Charon and possibly around onto Charon's far side. Almost four times as long as the Grand Canyon in US. It is nearly four times as long as the Grand Canyon, and also thought to be twice as deep in places, these fractures and canyons specify an immense geological disturbance in Charon's past. New Horizons team has also discovered that the plains south of the Charon's canyon - casually referred to as Vulcan Planum - have less huge craters than the areas to the north, signifying that they are remarkably younger.